STEM Education invites kids to use cross-disciplinary skills to explore, create, inquire, observe relationships, predict outcomes, and find solutions to problems. Hands-on opportunities, like the chain building challenge below, will compel kids to use critical thinking skills and garner tools to connect learning to their everyday world. SCIENCE: Students will use skills in the scientific method: observing, communicating, comparing, organizing, and relating. TECHNOLOGY: Students will document learning through the use of digital technology. ENGINEERING: Students will devise and implement a strategy to construct a chain link system. MATH: Students will explore measurement, graphing, patterns, and build mathematical knowledge through problem solving. Print the instructional file here (Download the chain link directions PDF) for each of the students. 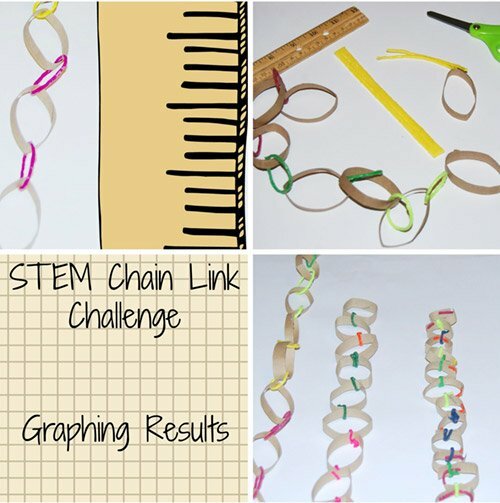 Students are challenged to devise a strategy, build a chain link with only the materials given, and measure the chains at the end of the time period to see which chain is the LONGEST. 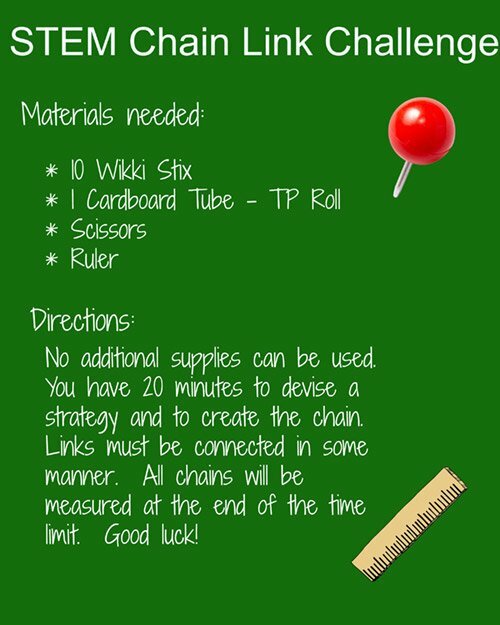 Each student (or partner teams) will have 20 minutes to devise a strategy and construct the chain. All chain links must be connected in some manner. Chains will be measured at the end of time limit. It is truly amazing to watch kids develop strategies and use critical thinking skills to create! Some of our classroom teams devised a plan to construct a chain with as many small cardboard circles as they could possibly cut from the cardboard tube. 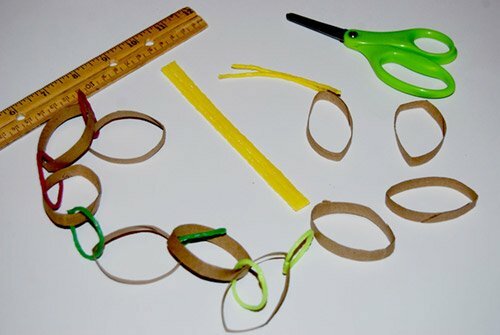 The small cardboard circles were connected with Wikki Stix. The teams predicted that MORE circles would create a longer chain. This strategy was not the best one for this particular challenge. Other teams cut the cardboard tube into thin, but larger, circles. The teams chose to connect the cardboard tube links with cut pieces of Wikki Stix. This design strategy was better, but it still wasn’t the longest. 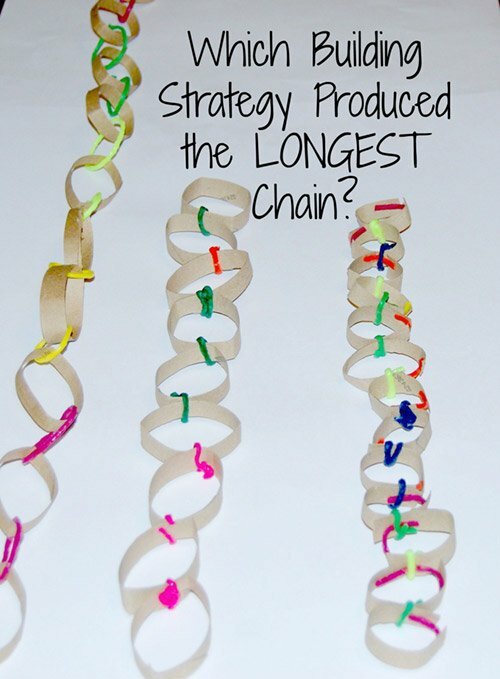 The longest chain was created by cutting the 10 Wikki Stix in half to make 20 pieces. 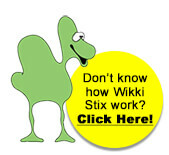 Instead of using the Wikki Stix to simply adhere the cardboard circles together, the team made Wikki Stix circles for the connecting links. It was an excellent design strategy for this challenge! 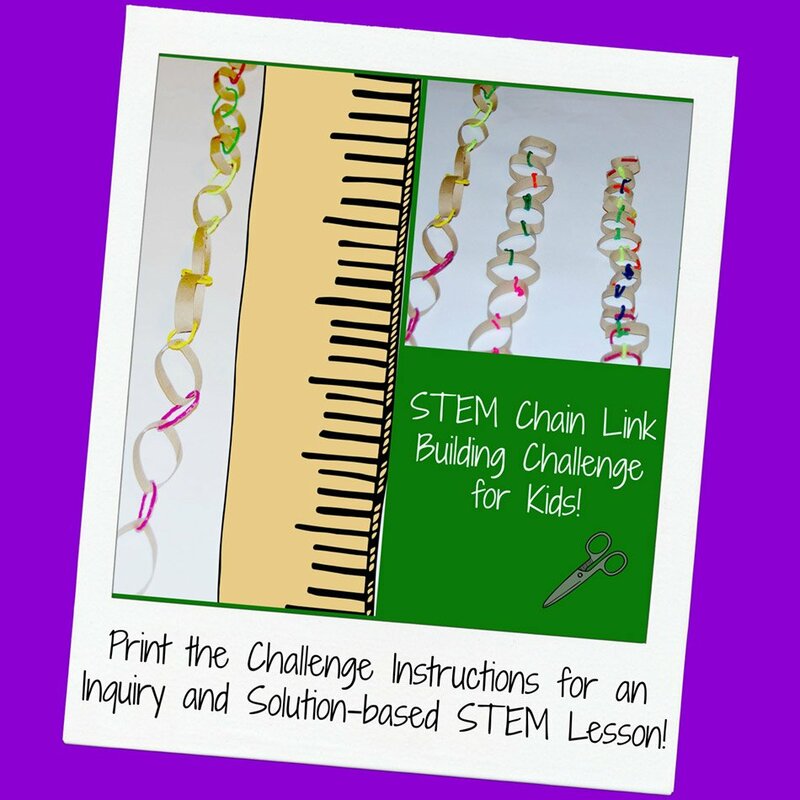 Print the Chain Challenge Response questions here. (Download the Chain Challenge Response PDF) Have the kids answer the questions and then come together for discussion and sharing of the individual responses. Print the Chain Challenge Graph here. (Download the Chain Challenge Graph PDF). Have the kids graph the number of total links on their own chain design and/or the designs of their peers. 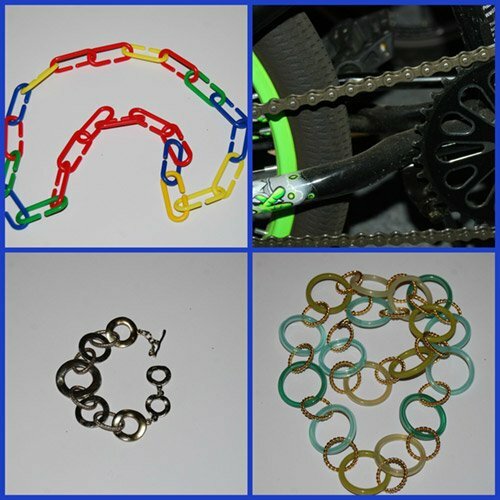 Invite the kids to photograph their created chains and upload the digital photos to Voicethread. Voicethread will allow kids to use the microphone feature to explain their strategy for design and the length of the chain upon completion. The completed Voicethread can be shared with parents or other classrooms. It is a great communication tool between classroom and home. Invite kids to look around the classroom, home, or community to find everyday examples of chain links. Ask parents to assist kids in taking digital photographs of chain links and send to class for sharing. Some of the examples our own kids found: a chain link fence, a bracelet, a necklace, a bike chain, a food chain, plastic link math manipulatives, a playground swing, and paper chains. What examples will your own students find? Chain links, by design, are connected. STEM and STEAM lessons encourage explorations through interconnected learning and challenge kids to apply classroom knowledge to the greater community!